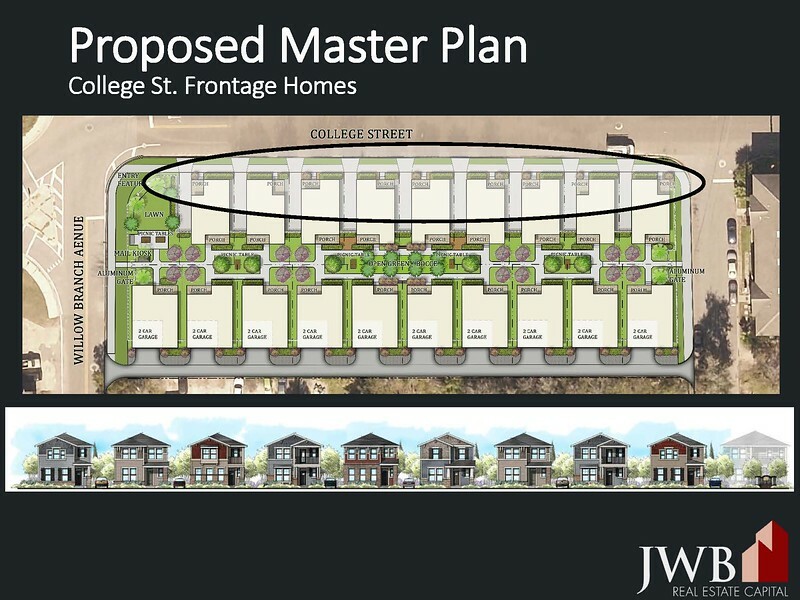 A zoning application has been submitted to develop a single family residential community of nineteen two-story single family detached homes along the north half of an entire block along College Street. 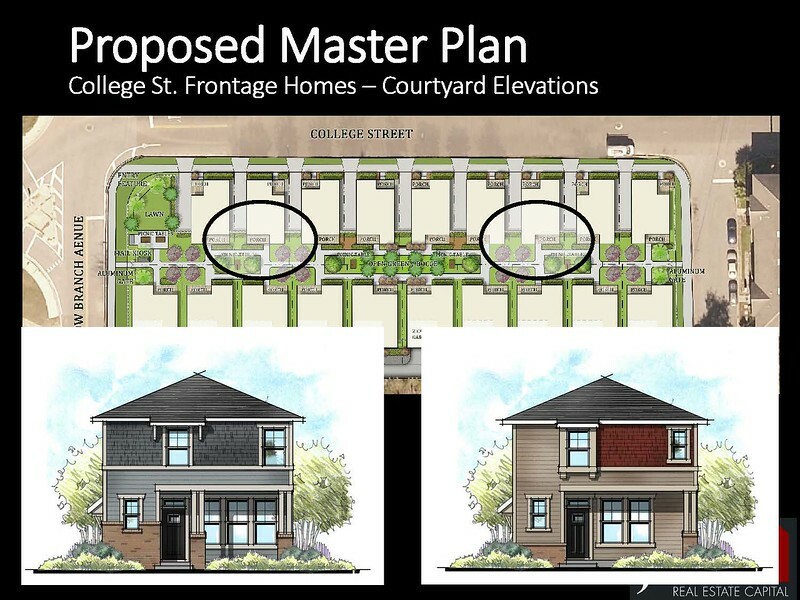 The new pocket neighborhood community is a cross between a row home development popular in urban neighborhoods, and a bungalow court that once enjoyed a brief period of popularity in the 1930’s. 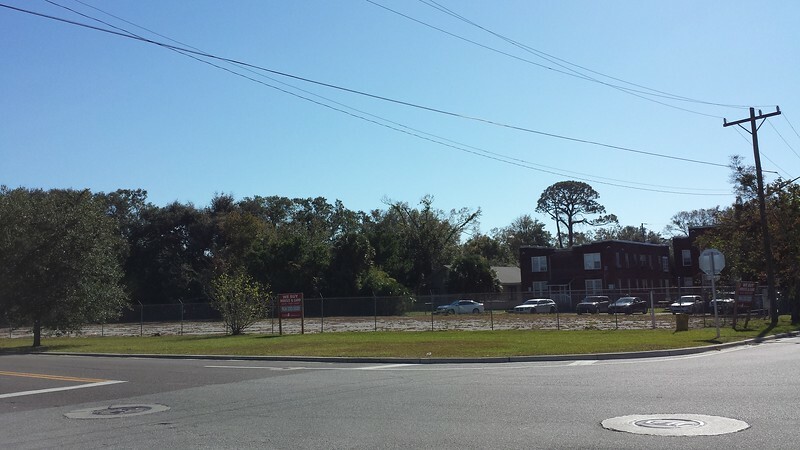 The property is currently owned and marketed by Hoose Homes & Investments, a subsidiary of Alex Sifakis’ JWB Real Estate Capital which builds, acquires and maintains single family investment homes. Curtis Hart, of Hart Resources LLC, is listed as the project’s developer. 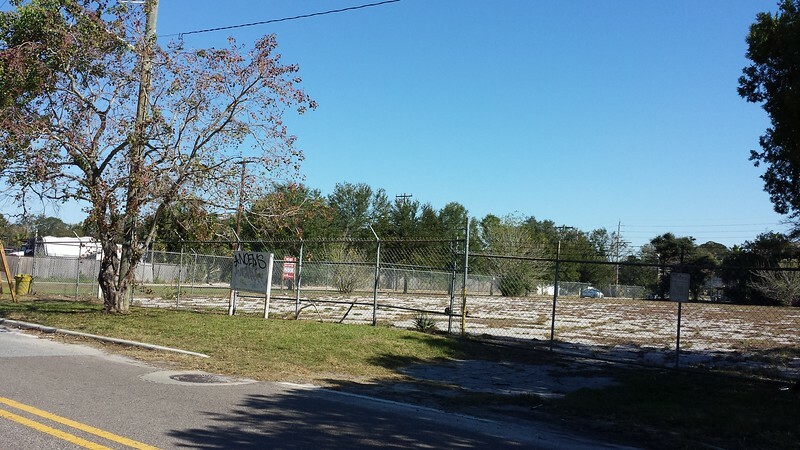 The site is bordered by apartments on the east and three smaller apartment buildings on the south west corner. Single family homes make up the rest of the southern border. The Nighthawks bar and live performance venue borders the west side of the property. Directly across the street bordering the north side of the project is an Industrial light former dairy now used as an aggregate storage area and heavy equipment storage site. 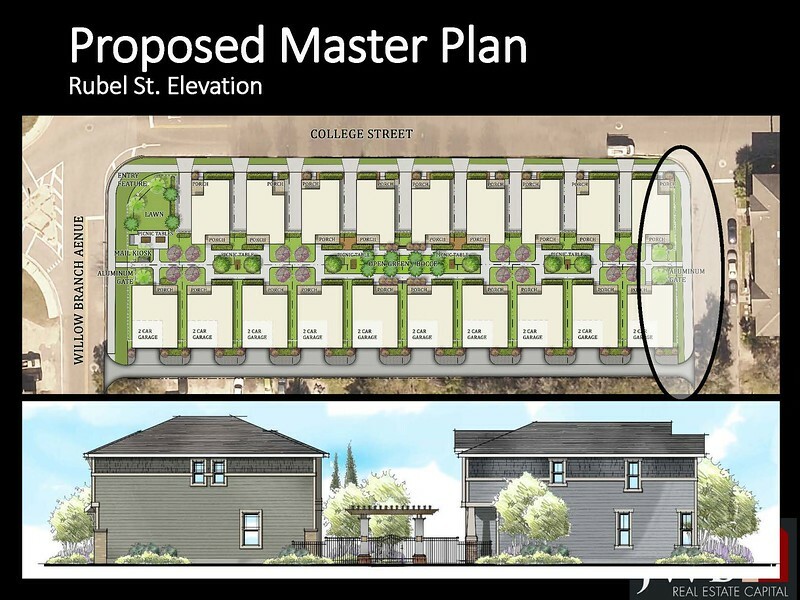 This unique development will consist of nineteen single-family homes constructed on twenty lots, with the empty lot being developed into a pocket park/greenspace. Ten of the homes will have two car garages, while the other nine homes will provide two parking spaces on site. 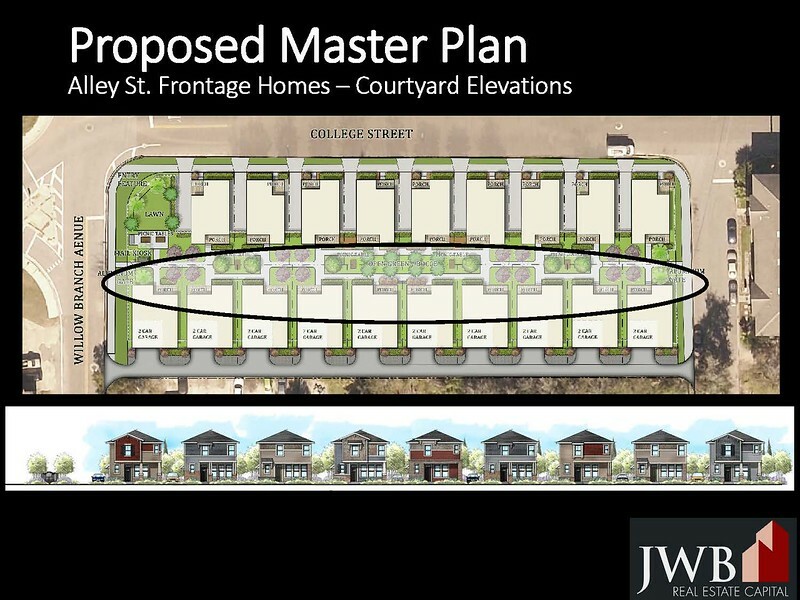 Besides the dense massing of the buildings, the most unique feature of the development are that the homes will be centered around a shared courtyard space - a 19 foot by 360 foot easement running the entire length of the rear of each 20 lots. Homeowners will share ownership/use of this communal common area. Before the last recession, this site was permitted for the construction of two mixed use buildings consisting of 24 residential units and ground floor office space. 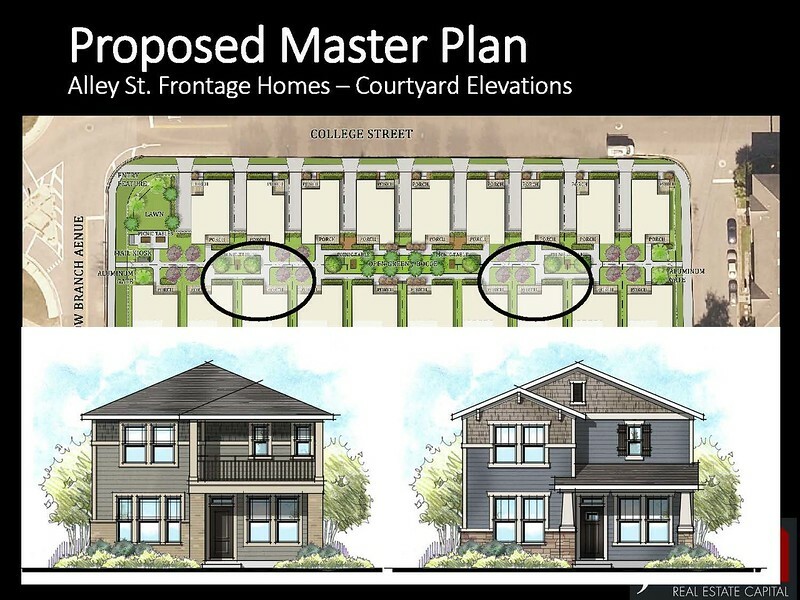 Since that time, a change in property ownership along with changes in market preferences have resulted in the new pocket neighborhood proposal. Each house will have several distinct design features in order to create a sense of architectural diversity. 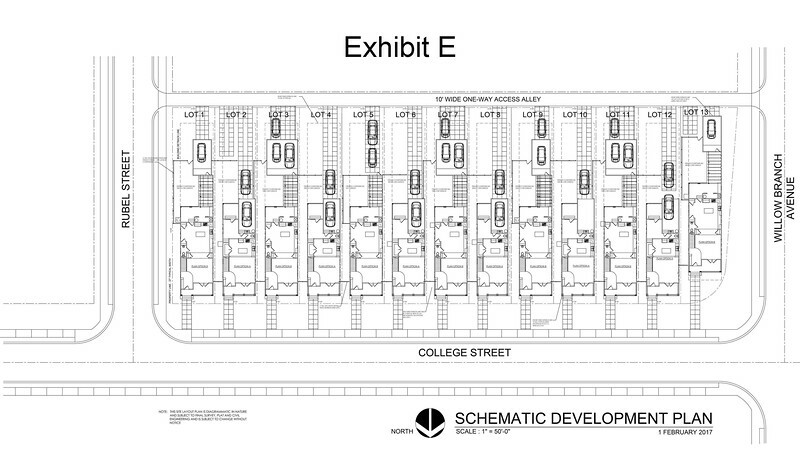 Vehicular access shall be accomplished by way of an improved ten (10) foot one-way alley to the rear of each unit. 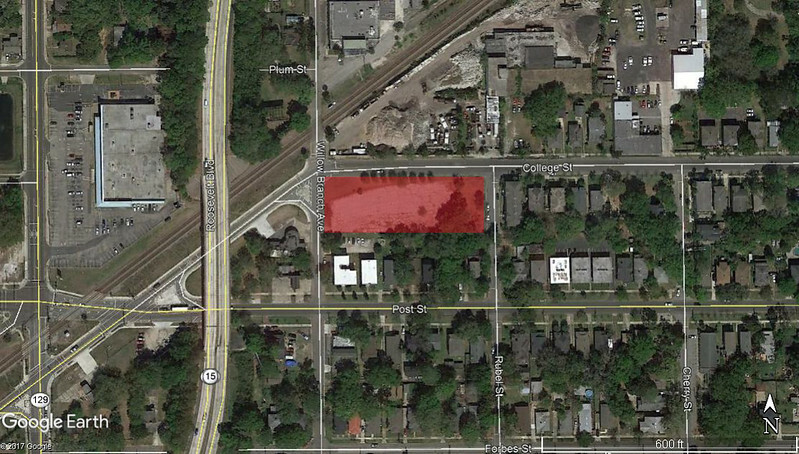 BEFORE Previously, a site plan was approved that featured two mixed use buildings and a surface parking lot. 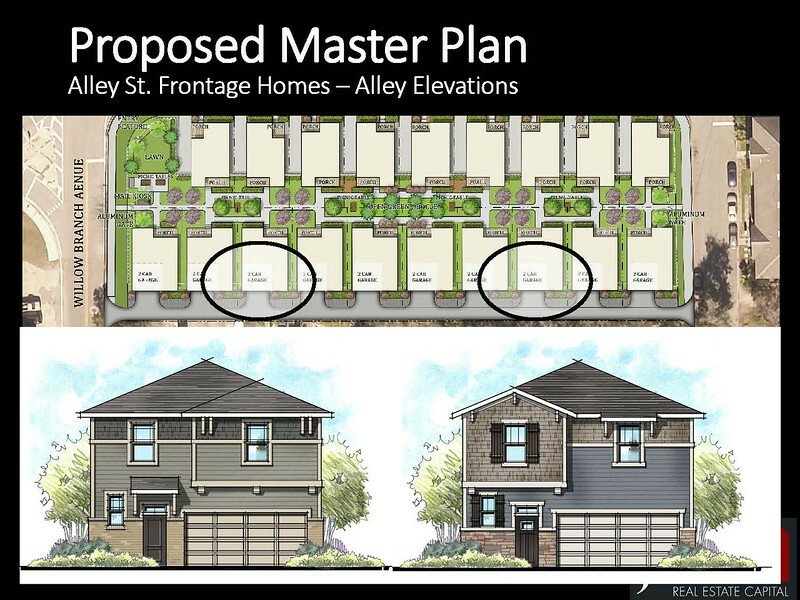 AFTER The current proposal features nineteen separate single family structures on virtually zero lot lines with a shared community space. 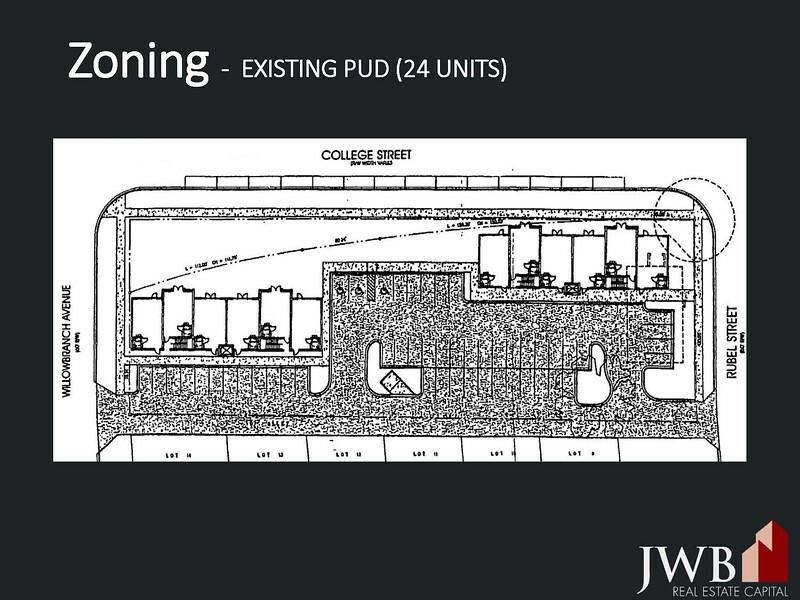 City staff has recommended approval of the development with several recommended conditions. 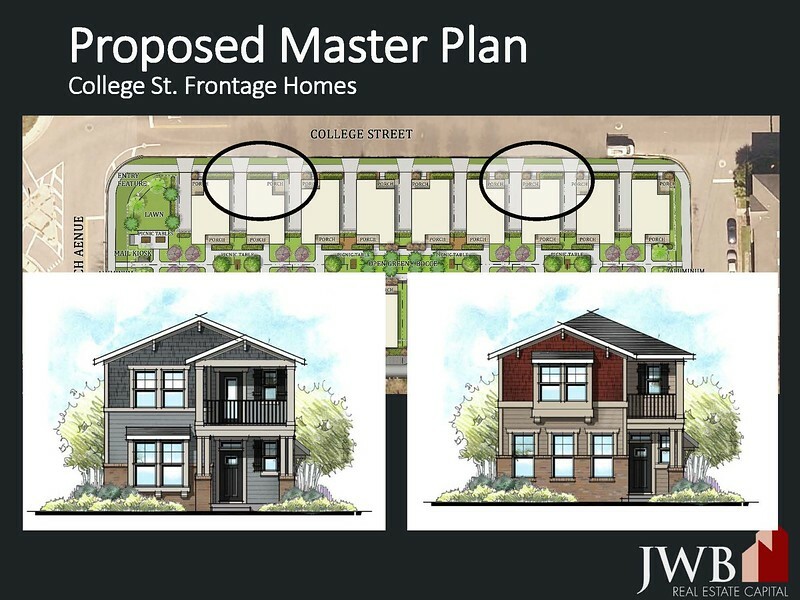 The entitlement of the proposed project will be first reviewed by the City of Jacksonville’s Historic Planning Commission this week. 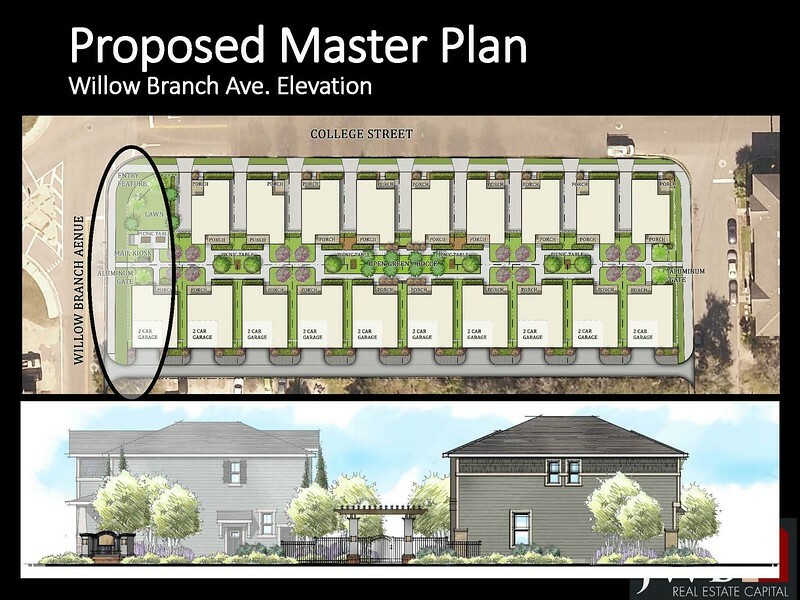 If approved, the project application will then move to the City’s Planning Commission, the City Council’s Land Use and Zoning Committee and ultimately for full approval by City Council. 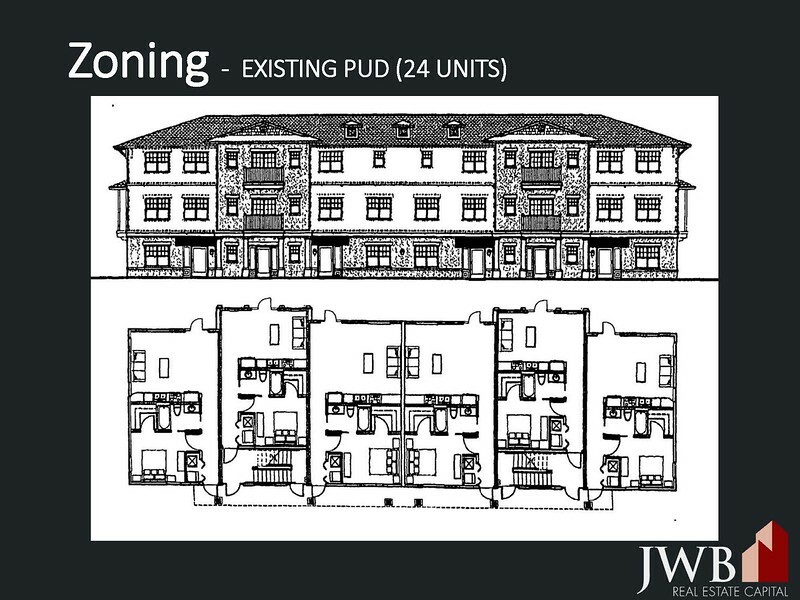 A look at various landscaping elements and treatments of the proposed housing development. "RAP is in support of the “courtyard” concept in this location, even though we recognize it is not a historic pattern, and would not be appropriate to other locations in the district. We feel this location allows for more density, and we support the rehabilitation and activation of the alley. 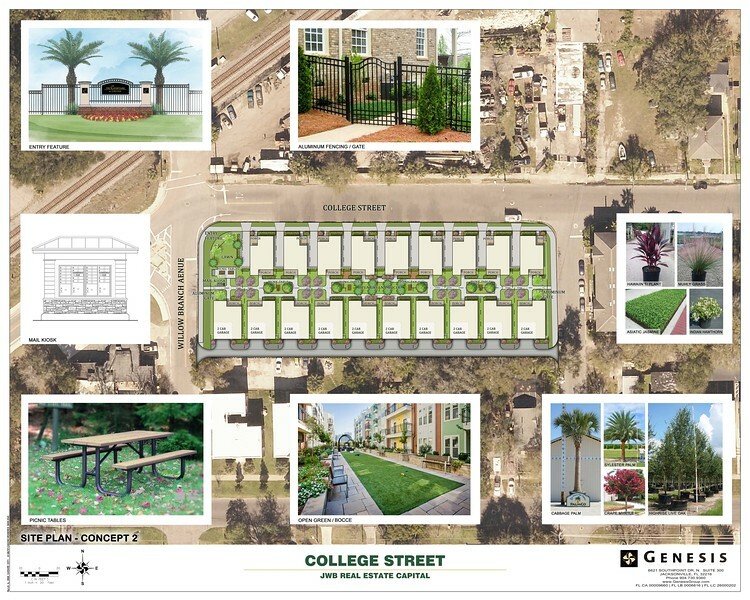 We are advocating that all four sides/streets of the project be designed in a residential and pedestrian scaled manner, and to respect the existing mature shade trees in the right of way. A primary goal is for the project to incorporate more architectural diversity in massing and design, and to reduce the subdivision feel and visual repetitiveness. Common area design, trees, and landscaping will also be critical to the success of the project."